Sharp look. Basically a pair of waterproof zero-grands - a dress shoe with extra laces. Poor traction in snow or slick conditions. These are very comfortable and amazingly light. They are really a good looking boot and ideal for the messy mid-west winter weather. Unlike any other sport boot I’ve owned. Comfortable, unique, and great with jeans. Great boots for the winter rains. Helps they are comfortable and stylish (get compliments every time I wear them). Great shoe; fits well with any style of dress.. The Zero Grand hiker is Very Stylish and comfortable. Also made my purchase on line and sent out in just a few days! I wore them for the first time today in the rain and they are amazing. My feet were completely dry, comfortable and warm. They were totally worth the money for the quality of the product. Great boot, I own almost every color. If you are looking for a leather that stretches this grey color isn’t for you, my black and brown boots in this style stretched perfect but the grey is stiffer and doesn’t stretch so get wide if necessary.. Most of my shoes are Cole Haan shoes. Of all the CH shoes I own, this style is my favorite. Light, comfortable to wear and they give my feet the best support! I even ordered a second pair in a different color. And they are easy to clean if they get dirty. This Hiker boot is highly recommended! The most comfortable hiker boot I have ever worn. Cole Hann leads the way a great product line of stylish and lite weight shoes. I feel like I am walking on clouds. Good bits for winter in the northeast. Warm and comfortable. Good looking boot. Distinctive without being garish. And they bring relief to my aged, arthritic knees. But don't wait until you develop arthritis to buy a pair. Healthy knees will enjoy this boot as well. These boots are worth every penny I spent. Not only do they turn heads and get compliments, but they are so comfortable, you wouldn't remember you're wearing them. They are light and gives enough warmth for your feet. Cole Haan shoes are my number one brand. Like always, Cole Haan is amazing. Its been a while since i bought the last pair of Cole Haans, it good to know that they are still the best choice in shoes. Excellent quality, great design and exceptional confort. Will deffinitely keep buying. Everything i've wanted in a boot! This boot has been my saving grace in my Ohio winters (which I dread every year). I am a nurse and these boots allow me to not worry about whatever surfaces I come in contact with. The bottoms are extra grippy on the heals and toes, but stay extremely lightweight. These boots also feel like running shoes and give amazing support! After all these amazing details, they are perfect to dress up or dress down with. I have never had a pair of boots in which I've been given so many compliments on. In the process of buying the all black ones now! Thanks Cole Haan! Great looking and comfortable. An excellent urban boot! Super comfortable and my new boot of choice. I broke them in during the recent rains in California. Very comfortable and truly water resistant. I wasn’t sure about the cherry trim but it was the right choice. A trendy modern turn on what would otherwise look like a traditional drab colored boot. Well done Cole Haan! Everything I expected, good quality and they fit perfect. Very happy with my purchase. Stylish, comfortable, and well made! because it's winter and this seemed like it'd be of great use , i have ordered 1 for myself from the women's section and i love it ! it's super warm and comfortable . They're good-looking and seem very functional. Glad I submitted my order when I did, though -- if I'd been a minute later, it looks like the price would have gone up over $100.00! I have a pair for myself, which I love. Bought them for a gift! my son wanted them for his birthday! its a nice looking boot the price is right! A VERY SHARP LOOKING SHOE. AND I AM POSITIVE IT WILL BE CONVERTIBLE AS GOOD LOOKING. The water resistant aspect of the shoe. Fantastic elegant boot with comfort and the Cole Haan quality. Tried them on and loved them. I like the style and have had nothing but great experience with Cole Haan quality. My husband was looking for a more stylish practical boot to use in the snow during the winter that he could also get away with wearing to work when needed. I like the color and the reviews from other customers seemed to suggest this is a great boot. I have these boots in two other colors. Great to walk in, feet do not get hot and are pretty stylish for trekking through the rain. I have the dress shoes and I absolutely love them! I love the Rugged weekender look of this boot and I wanted a boot that is waterproof. I have another Zerogrand shoe, so I am expecting this to be comfortable and supportive sole (for my needs). With what appears to be a softer top, it should not rub/irritate my ankles (as some true stiffer hiking books may). Urban style with accents (laces and sole trim). Works with jeans and maybe khakis. This review is not based on actually wearing the boot yet (11/22/18). With a fabulous Black Friday sale, definitely worth the trying. I am a huge fan of Cole Haan shoes, love the comfort and designs. For me, the best you can buy. i like hiking and that color fits my choice of outfits in general. Great shoe!! very comfortable and received many compliments on the style!! what is the inner lining of this item? Is it WARM/for WINTER? BEST ANSWER: It’s not “warm” like a Sorrel lining. But it’s also not cold either. I usually wear a pair of dress socks with these and they’re warm enough in snow and slush. Very warm. I used it through out the winter without no issues. I leave in Boston which is a very cool city in winter. Normal boot liner...it’s great at keeping the water out, but I wouldn’t say it’s warm. Lining is polyester. Best to add a ZG boot sock for warmth! The top collar is a wool and poly blend. No exactly sure what the material is but its man made and water-resistant. And yes it is warm. Is this boot slip resistant as well? BEST ANSWER: Yes. It is slip resistant. what do these boots weigh? BEST ANSWER: Very lightweight. I'd say about 15 ounces each. I don’t know the exact weight, but they are very lightweight and extremely comfortable! Just bought these in the store. Should I still spray them or that is not necessary since they are already water resistant? How do I clean the boots? When will this boot be back in stock in a wide? BEST ANSWER: The ZeropGrand Water Resistant Hiker Boot was a limited production style and is no longer available from us. However, you can try an online search to find possible availability at our retail partner stores. Use quotation marks: "Cole Haan ZeroGrand Water Resistant Hiker". How do these shoes handle the Snow? BEST ANSWER: This is a water-resistant hiker style boot. While the sole is textured, it is basically flat (not lugged) and designed for dry weather wear. 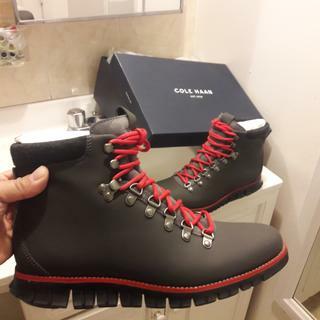 Are these boots resistant to -10 to -30 degrees celcius temperatures? BEST ANSWER: This is a fashion, Hiker-inspired style created with water-resistant leather and not a performance-rated Winter boot. We don't rate for temperature, but this boot would be as warm as any other unlined or uninsulated leather chukka. The most important question to me is whether the sole of the shoe can burst from cold?